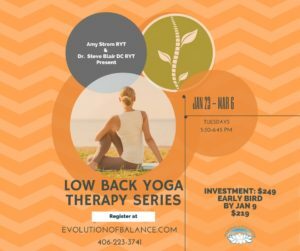 The Low Back Yoga Therapy Series facilitated by Steven Blair and Amy Strom, will be on Tuesday evenings, 5:30-6:45, January 23rd-March 6th, classes will be located at Montana Lotus Yoga, $249 for the entire series, $229 if registered before 1/9/18. I'd recommend Dr. Blair to anyone needing chiropractic adjustments. He is capable, responsive and attentive, listening to exactly what your body needs and delivering powerful healing help! My neck is super sensitive and it's great to know he's there for me. Dr. Blair also has a superior knowledge of yoga and anatomy, and can give recommendations for poses and stretches to keep you balanced. Last week I completed an Evolution of Balance Yoga lower back series. Our session leaders were encouraging and positive with a beginning yoga practitioner (me! ).The therapy application was excellent, I have tools to prevent and relieve my office and injury related symptoms. I have been give several therapy routines, this series is easily done at home I have been using them regularly since our first week. Amy and Steven throughly understand and apply the techniques to the group needs. They are a great team, making the sessions well rounded and allowing for close supervision. Finally I have a new interest and appreciation for yoga practice. Thank you both for a valuable and truly enjoyable series. Dr. Blair was so awesome. He really listened to what I told him and worked with me. I also love that he does yoga therapy and knew exercises that would help mekeep getting better.